He’s as calm as he can be, given the situation. There’s 50 feet of vertical ice between us, a white curtain that keeps me from being able to see the expression on his face, but just a mention of the term “screaming barfies” is disconcerting enough. An affliction that affects ice climbers, the screaming barfies is an intense bout of pain that hits your hands fast, and is so severe, that it makes you nauseous. It has something to do with the restricted blood flow to your hands when they’re held above your head during vigorous exercise in cold temperatures, like, say, ice climbing. When you reach the top of the climb, you drop your hands, the blood rushes back, bringing with it a world of pain. You want to scream and vomit. I stand at the bottom of the waterfall, casually throwing my axes into the chunky ice in front of me, waiting for Weil to either throw up or tell me he’s on belay, whichever comes first. We’re on the west side of Sam’s Knob, one of North Carolina’s towering 6,000-footers that hems the edge of the Blue Ridge Parkway. This particular mountain rises steeply from State Highway 215 between Brevard and Waynesville. In the summer, Sam’s Knob has excellent camping and pretty good canyoneering, if you know where to look. In the winter, if you’re patient and willing to bushwhack through briars and rhododendron, there’s ice climbing to be had. 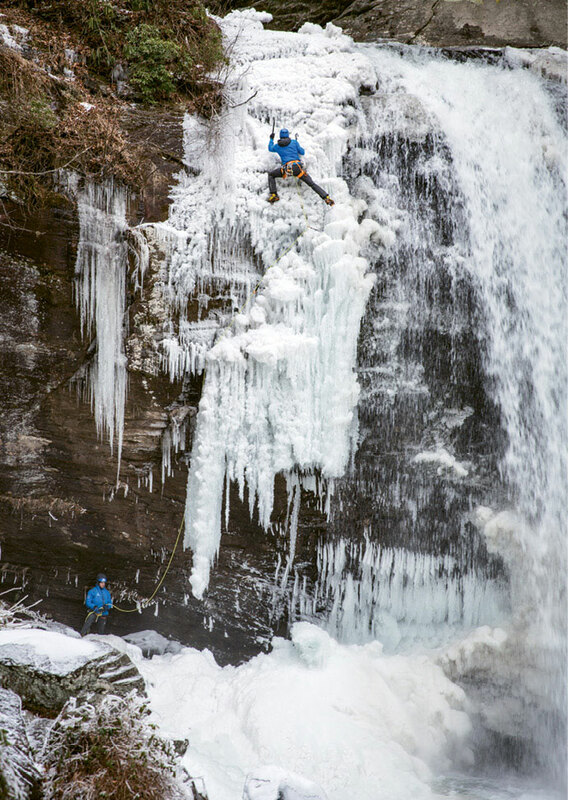 Ice climbing in North Carolina is a fickle endeavor, but it does happen, probably more often than most people realize. It takes at least three consecutive days of sub-freezing temperatures for the ice to become climbable, and then it could disappear in a day or two if the temperature swings the other way. When the “ice is in,” as they say, you’ll see climbers swinging axes and digging crampons into high elevation road cuts where water trickles have formed into walls of white ice. Whiteside Mountain, which is a popular climbing destination during warmer months, turns into the state’s most popular multi-pitch ice climb. Deep in the backcountry, small waterfalls transform into frigid pillars. In 2014, a few lucky individuals even got to send (that is, to climb) a frozen Looking Glass Falls. Fox’s guides are some of the most experienced ice climbers in the state. They lead annual ice climbing trips to New Hampshire and teach clinics at the Ice Climbing Festival in Ouray, Colorado. But during good ice seasons, they’ll climb as much in North Carolina as they climb out of the state. Julian announces when the conditions are conducive via Fox’s dedicated Southern Ice Facebook page, and clients clamor for a spot on the guided trips—like the one I’m on, which follows a skinny drainage up the side of Sam’s Knob, miles from the nearest maintained trail. We spend a solid 30 minutes bushwhacking from the car to the beginning of the first pitch, hauling backpacks full of ropes, ice axes, and sharp crampons up steep slopes and through narrow rhododendron tunnels, at times pulling ourselves up by the roots. The first pitch of ice we climb is mellow, allowing me to get my bearings while I scrape over 25 feet of sloping, icy boulders, but then the creek is choked with brush and debris so we move to the side to climb mossy rock slides dusted with a thin layer of snow. We’ll repeat this process throughout the day—climbing, bushwhacking, scrambling. It’s an adventurous route—Julian was with us for the first half of the climb, but she cut the corner of her eye during one of the bouts of bushwhacking and decided to call it quits. Weil, another of Fox Mountain’s guides, spends most of his free time during the winter months searching the mountains surrounding Brevard and Cashiers for creeks like this that he can climb when the conditions are right. The view opens up the higher we climb, and the ice becomes more vertical and more demanding. Occasionally, I’ll sink my axes next to a thin vein of ice where you can see the water running beneath the glassy sheet. The bubbles in the water look like fast-moving snakes below the ice. You want to hear a thud when you swing your axe into the ice above your head. The motion is simple—most of it is in the wrist, like fly-fishing—but when you grow tired, it becomes more and more difficult to make a solid connection. As for the crampons strapped to my feet, it’s like learning how to walk again. You have to put a lot of faith into those spikes that stick out from your toes. As with rock climbing, most of the work when you’re sending ice is done with your feet. You kick your toe into the ice and pray that it holds while you kick your other toe a bit higher into the ice. Repeat that process roughly 700 times from the bottom of the mountain to the top. Then, Weil tells me he has the screaming barfies and suddenly I’m feeling mortal again. After a few minutes of recovery, during which Weil never actually throws up, he gives me the go ahead and I start climbing slowly upward. The last pitch is the longest. First, you climb a slightly sloping waterslide to a frozen eddy, then you have to climb a 20-foot vertical pillar with an abrupt top-out on a flat boulder. This is the crux of the entire climb. The ice is thin on top of the boulder, so it takes several minutes of me swinging blindly at the ledge above my head before I get the axes to grab onto something solid. By the time I top out on that ledge, I’m spent and can barely crawl up the last portion of the pitch—a skinny chute with bulbous ice that looks like a crusty, white lava flow. We sit on the edge of a rock, the icy river receding into the woods above us, and the valley opening up below. It’s a blue bird day, maybe 30 degrees. Tomorrow’s supposed to be warmer, and the next day even warmer. “The ice might last until Sunday,” Weil says, eating a sandwich he pulled from his pack. There’s probably a lesson to be learned here, something about “seizing the day” and all that, but honestly, I’m too tired to let anything but the view in front of me sink in. Fox Mountain Guides leads ice trips whenever the conditions are conducive. For up-to-date reports, visit www.facebook.com/seiceconditions. See foxmountainguides.com or call (828) 284-8433 for more about the company’s classes and climbs.